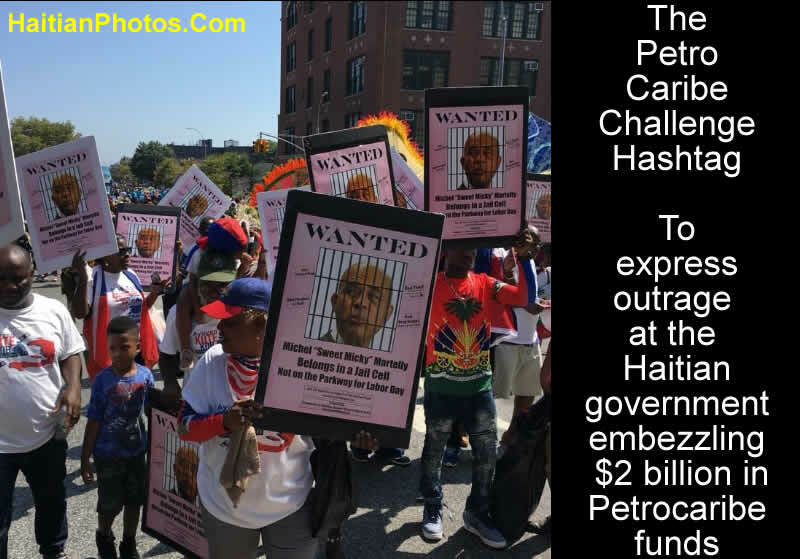 The Petro Caribe Challenge hashtag meant to express outrage at the Haitian government embezzling $2 billion in Petrocaribe funds. The #PetroCaribeChallenge, a Hashtag meant to express outrage at the Haitian government embezzling $2 billion in PetroCaribe funds, is slowly evolving into full-fledged protests. On August 24, 2018, Haitians protest to call for an investigation into the alleged misuse of Venezuela-sponsored PetroCaribe funds by previous administrations, in Port-au-Prince. PetroCaribe was an agreement by Venezuela, with 13 Caribbean countries on July 29, 2005. The objective of PetroCaribe was to alleviate the burden of rising oil prices and its negative impact on Caribbean countries. The countries under the agreement were allowed to purchase 185,000 barrels of oil per day on preferential terms. Additionally, these nations could settle their debt to Venezuela using goods and services. During the period of Haitian President Rene Preval it was decided as per the agreement that Haiti would buy oil from Venezuela, paying only 60% up-front with the remainder payable over twenty-five years at 1% interest. This oil support from Venezuela was the key in providing basic needs and services to 10 million Haitians, securing a guaranteed supply of oil at stable prices and a basis for relief from the dependence on oil from the U.S. Since 2008, Venezuela has provided nearly $1.9 billion in petroleum products, with over $800 million being paid up-front. Following the earthquake, Venezuela cancelled some $400 million of PetroCaribe debt, yet with large disbursements since the earthquake, Haiti still owes some $580 million. While significant resources have already been spent, Haiti maintains a balance of $350 million in PetroCaribe funds. The administrations that controlled the PetroCaribe fund are currently under an investigation for corruption. Also, the funds in question have grown to more than 4 million dollars. Consequently, the public has exploded in protest to the government decision in July to increase fuel prices by as much as 51 percent. A report detailed that $1.7 billion worth of no-bid contracts was given by the Haitian government between 2008 and 2016. The projects, which included government ministries, housing for the poor and a new parliament building, were all awarded using PetroCaribe money. Contracts were signed and paid, but many of the projects were never completed. A company named GTC Construction firm received $ 21 million or over 95 percent of the total cost of the project for performing only 8 km road or 44 percent of the work. Moreover, a new contract was signed by the MPCE with the same construction company for $ 45 million with also PetroCaribe funds. 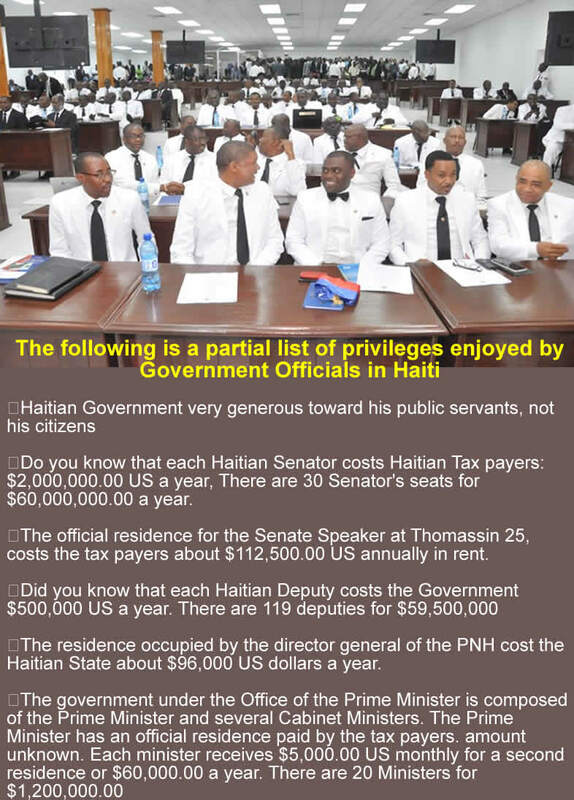 Do you know that each Haitian Senator costs Haitian Tax payers: $2,000,000.00 US a year, There are 30 Senator's seats for $60,000,000.00 a year. The official residence for the Senate Speaker at Thomassin 25, costs the tax payers about $112,500.00 US annually in rent. The residence occupied by the director general of the PNH cost the Haitian State about $96,000 US dollars a year. A news in July recently ignited the social networks that the official residence of Senate Speaker Joseph Lambert at Thomassin 25, is costing 7.2 million gourdes (7,280,000 gourdes) annually. According to Senator Ricard Pierre, Joseph Lambert has paid the rent of his official residence, a sum of about 8 million gourdes for a year. These millions have been taken from the pockets of the poor Haitian citizens through the Senate budget. In response, Senate Speaker Joseph Lambert summoned accredited journalists to Parliament on July 16, 2018 and explained, if the Republic pays for an official residence for the head of state, an official residence for the prime minister, even the chief of police has an official residence, why not one for the president of the National Assembly, who is the second personage of the Republic. Is it not a matter of prestige?" He justified his statement with a reference by reading the minutes of the Conference of Presidents held on Monday, March 5, 2018. This recording of the minutes was proposed by Artibonite's Carl Murat Cantave in the conference of presidents. Cantave had proposed that the Senate of the Republic should pay for an official residence for its president. 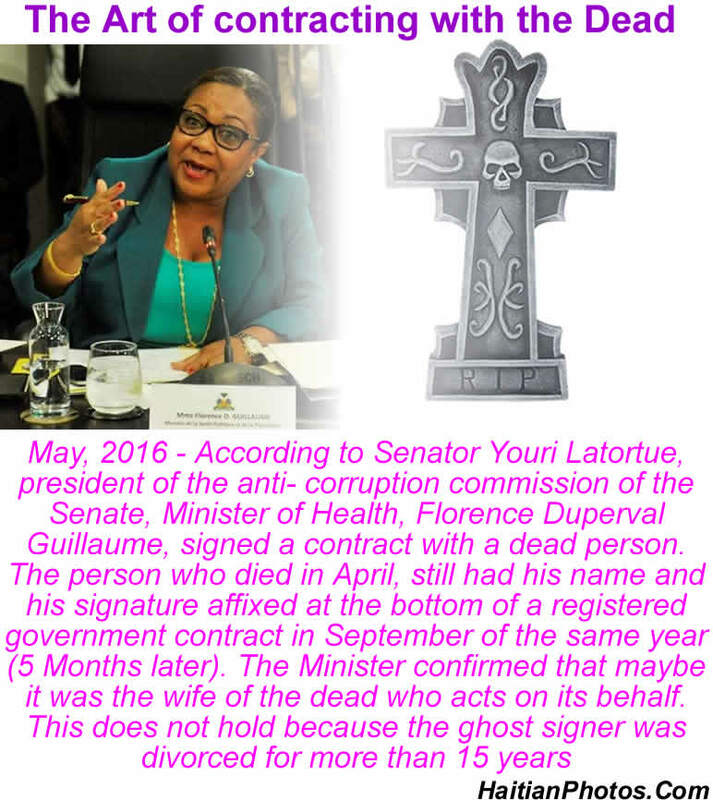 His proposal was seconded for validation by Senators "Denis Cadeau, Onondieu Louis, Nawoon Marcellus, Jean Renel Sénatus, Ronald Lareche, Dieudonne Luma Etienne, Richard Lenine Herve Fourcand, Jacques Sauveur Jean, Yurt Latortue, Gracia Delva, Jean Rigaud Belizaire, Jean Marie Ralph Fethiere, Kedlaire Augustin, Saurel Jacinthe and Joseph Lambert. According to Joseph Lambert, these senators unanimously "approved and instructed the office for necessary follow-up". During that conference, Senator Cantave also proposed that the Senate Speaker should have his own procession involving vanguard and rearguard and be preceded by two motorcycles mounted by police officers in uniform. However, Joseph Lambert dismissed that for fear of criticisms. 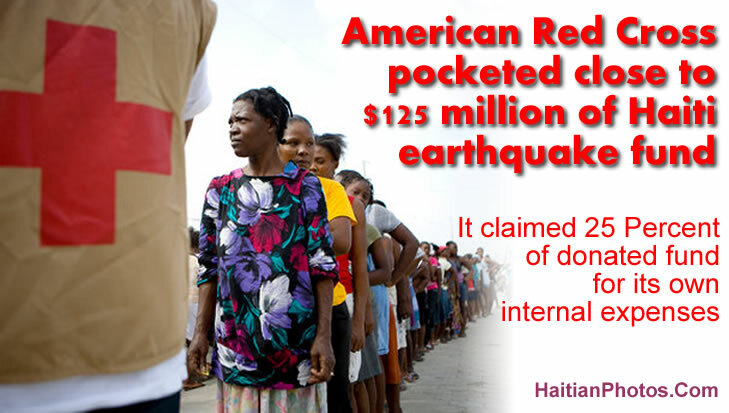 According to a report released by Iowa Sen. Chuck Grassley, American Red Cross pocketed close to $125 million of Haiti earthquake fund. Based on a yearlong investigation by the Iowa Republican and his staff, Iowa Senator Chuck Grassley has reported that the esteemed charity organization Red Cross received an outpouring of donations after the 2010 quake, nearly $500 million, more than any other nonprofit organization received. But sadly, its all ambitious plans to build housing for the earthquake victims completely failed on the ground in Haiti. The Red Cross says it has provided homes to more than 130,000 earthquake victims. But the actual number of permanent homes the group has built in all of Haiti is just six. As per the charity organization's report, they spent $70 million on "program expenses" which include funds spent to oversee and evaluate its Haiti programs. In its earlier reports, Red Cross's had repeatedly told that, of the total funds it receives on humanitarian programs, it spends up to 9% (in recent case, it should be $45 million) on internal expenses. However, Grassley's office found that 25% of the total donations ($500 million) sent to Haiti or about $125 million were spent as fundraising and management expenses. As the United States launches criminal proceedings against officials of world football's governing body and after Seven officials and associates were arrested in Zurich earlier this week, new we have Haiti emerging as one of Fifa's most extravagant expenses claims within the past several years. It was reported that after the Haiti earthquake of 2010, the president of FIFA, pledged some money to Haiti. However, former Fifa vice-president Jack Warner did not think all that money should go to Haiti. But Yves Jean-Bart, head of the Haitian Football Association, claimed only to have seen a fraction of that money reach his country. According to the head of Haitian Football Association, Yves Jean-Bart, only a small portion of that money ever reached Haiti. Among many expanses that could not be traced, Jack Warner contracted with a company in his native country of Trinidad to produce emergency supplies for Haiti in the amount of $229,000. There is one problem: that particular company never existed. Ex-FIFA Vice President, Jack Warner, is under fire for misappropriation of funds he raised from FIFA and the Korean Football Association, a sum of $750,000. U.S. prosecutors have been investigating him, and want him extradited from Trinidad and Tobago to answer charges of corruption and bribery in court. He is alleged to have redirected $750,000, earmarked to help survivors from Haiti's 2010 earthquake, into his personal accounts. He claims he is innocent of all charges. 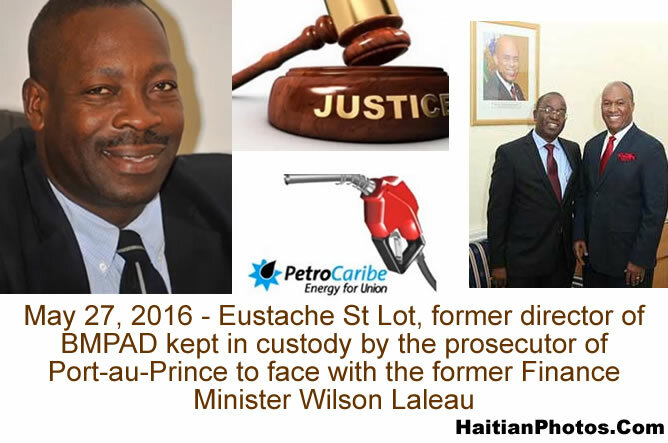 May 27, 2016, Eustache St Lot, former director of BMPAD kept in custody by the prosecutor of Port-au-Prince to face with the former minister Wilson Laleau. Mr. Eustache Saint-Lot, the former General Manager of BMPAD (Monetization Office of Development Assistance Programmes), was held in custody along with his lawyer Patrick Maitre Lawrence by the Commissioner of Port-au-Prince Parquet, since Friday, May 27 till June 3, 2016. They were kept under an order of the Director of the Public Prosecution at a police station in the capital, awaiting the arrival of the former Minister of Economy and Finance, Wilson Laleau who is traveling abroad. However, they were released later on a bail of 100 million gourdes. Wilson Laleau spent five years in the Martelly administration as the Minister of Trade and Finance. He has been also summoned by the new Government Commissioner of Port-au-Prince. Mr. Jean Danton Léger. As per opinion of the new Government Commissioner Léger, Mr. Eustache Saint-Lot and former Minister Wilson Laleau had given contradictory statements against each other in separate hearings in regard to the management of PetroCaribe fund amounting to $1.5 million. The Commissioner wants to question and hear these two men together in the same place and at the same time "to get the truth out of the bottom of the well." 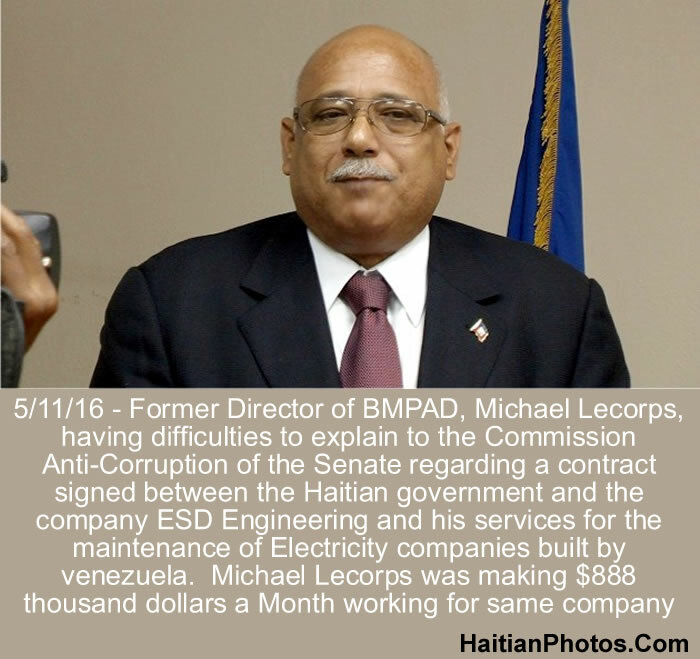 5/11/16 - Former Director of BMPAD, s, having difficulties to give explanation to the Commission Anti-Corruption of the Senate regarding a contract signed between the Haitian government and the company ESD Engineering and his services for the maintenance of Electricity companies built by venezuela. Michael Lecorps was making $888 thousand US dollars a Month working for the same company. At a hearing of the Ethics Committee and Anti Corruption Senate, on May 12, 2016, Michael Lecorps, the former Director (between 2013 and March 2015) of the Office of Monetization of Development Aid Programs (BMPAD) has said that the management of fund of his institution was proper under his direction. Such management of PetroCaribe funds was certified by the audit of the Superior Court of Auditors and Administrative Disputes (CSCCA) as "in the line of the laid down provisions". The funds were disbursed by the Treasury as per mentioned guidelines only on the requests of the Ministry of Finance. The BMPAD had no intervening authority to supervise the implementation and execution of the projects undertaken by the respective departments. Management of PetroCaribe funds during his tenure, including the quick transfer of oil funds to Venezuela, had been always transparent and disclosed on the institution's website. 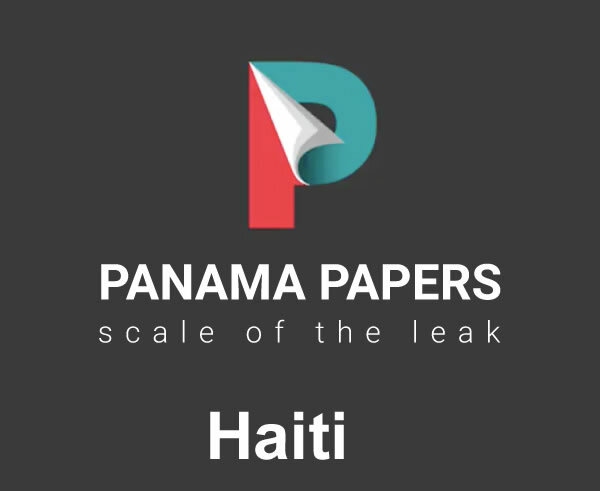 We have learned that there is an involvement of some Haitians in the Panama Papers leaks. The Panama Papers are an unprecedented leak of 11.5 million files from the database of world's fourth largest offshore law firm, Mossack Fonseca, specializing in the creation of offshore companies. The leak has also revealed how the rich and powerful people, sometime hide their assets. Some documents found in Panama leak, suggest how politically connected Haitian officials tried to make profits from fuel shortage in Haiti out of a 2014 oil deal valuing $30 million between Haiti and Trinidad and Tobago. Some of the Haitian characters involved in the scandal are, Georges Andy René, who served as head of the Centre de Facilitation des Investissements (from August 2012 to February 2014), an ex-bank executive, and Ralph Pereira, a close friend of former President Michel Martelly. Georges Andes Rene, as the head of Haiti's State-run investment agency, and advisor to then Prime Minister Lamothe, set up shell companies - through Panamanian law firm, Mossack Fonseca to benefit from the deal. In last month, Senator Ronald Lareche said, a special commission would be created to investigate the spending and contracts under former President Michel Martelly's 2011-2016 administration. Here are some of the statements made during a speech given by former Haitian President Jean Bertrand Aristide on September 27, 1991. 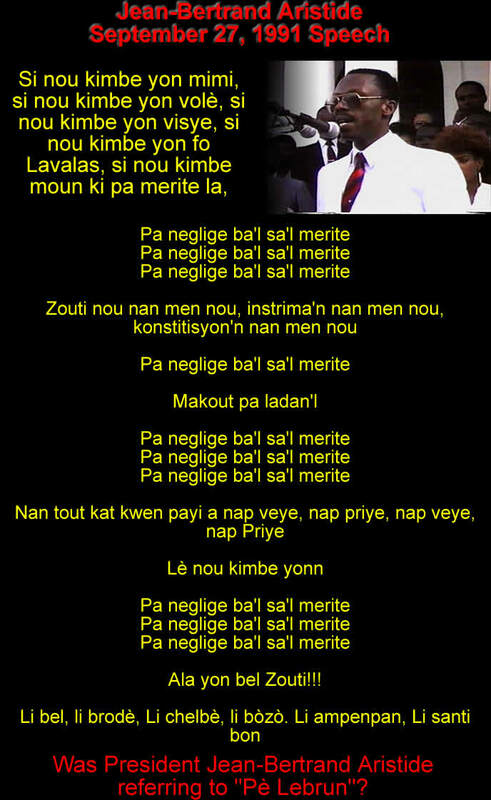 Do you think that the speech promotes violence and the use of Pè Lebrun by the Haitian population? Aristide was without equal when it comes to popularity among the people. He won the nation's first democratic election in December 1990 with 67% votes. However, he was caught between plots by the Duvalierists with country's wealthy elites. On Friday, September 27 1991, he delivered a speech, activating the common people against the wealthy elites and power mongers of the country. This speech is famously known as "Aristide's Famous Pe Lebrun Speech" and as a consequence, on September 29, 1991, Aristide was overthrown, just two days after delivering the speech. In every protest in Haiti, the protesters often burn tires. Pere Lebrun was the name of a former tire manufacturer and a major retailer of automobile tires in Haiti. 'Pe leburn' is a nickname of burning tires. In his eight months in president's office, Aristide alienated many civil servants, attempted to undermine the country's military forces and challenged the authority responsible to draft the constitution. He publicly distinguished the elites between patriotic elite and the 'patripoch' (pocket-stuffing) elite. Aristide's supporters, following the historic speech on September 27, intimidated the news media that Aristide would legitimize his speech. He would place burning tires around the necks of the suspected opponents and burn them to death. However, very few historians have had the opportunity to hear and understand this historic speech live on September 27th which is often considered as his best speech delivered so far.  It is a fact that there is no proof anywhere that suggests Aristide's policy was to urge people to burn people. Rather, when he came to power in 1991, unlike his predecessors, he tried to bring more issues and people under the rule of law. There are many Haitians who think that Aristide was unfairly treated. He was demonized by wealthy Haitians who own 90% of Haiti's wealth and act as overseers for empire. Aristide denounced the evil schemes of these imperialists and their agents in the Haitian oligarchy. The problem of corruption in the Haitian society. 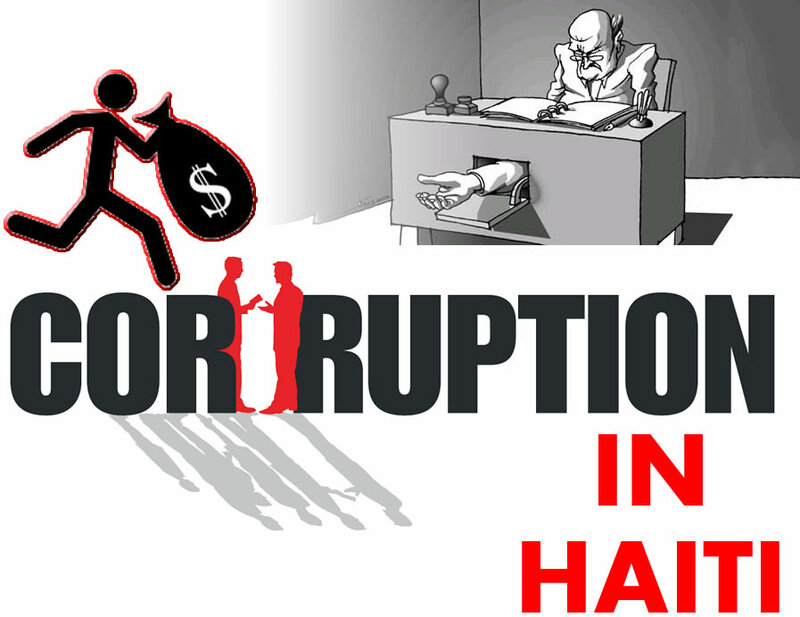 The 2014 Corruption Perception Index, which measures the perceived levels of public sector corruption in 175 countries across the world, places Haiti as one of the top corrupted countries in the world. A country's rank indicates its position relative to the other countries in the index on a scale 0 (highly corrupt) to 100 (very clean). The top three countries, with the highest scores in 2014, were: Denmark (92 score), New Zealand (91) and Finland (89). Sudan, Korea (North) and Somalia hold the last three ranks in the list, 172nd, 173rd and 174th with only 11, 11 and 8 scores respectively. Haiti and Venezuela hold the 161st rank jointly with 3 other countries (Guinea-Bissau, Angola and Yemen) and each of them scored 19 points only. Haiti's neighbor Dominic Republic comes 124th in the list with 30 points.